She gave birth to a boy surrounded by animals, filth, and dirt. There was no midwife or doctor or antiseptic or sterile instruments. There was no one to help. She was young – probably not fully physically mature. Still, she gave birth to a boy and survived. The unnamed miracle of Christmas is that Mary survived. I first heard this statement from Katey Zeh, Project Director of Healthy Families, Healthy Planet. This initiative of the United Methodist General Board of Church and Society is funded by a grant from the United Nations. Its mission is to educate people about the dangers of motherhood in the Global South, and to advocate for the protection of these mothers. They have produced this video, which is worth a watch. A lot of people get very tense when you start talking about family planning. This is a hot-button issue in American politics. Yet I believe that this project is one of those things that can and should transcend partisan politics. Maternal health is a pro-life issue, and so is family planning. Family planning includes education about contraception, birth spacing, and the importance delaying a girl’s first pregnancy. Maternal health is not a women’s issue. It is a human issue. When women are healthy, their children are healthy. Education about women’s health reduces abortions, miscarriages, and maternal mortality. That is something we should all be able to support. In many parts of the world, where women are still treated much like cattle, family planning and education can be a matter of life or death for a mother and her children – both born and unborn. This Christmas season, as you ponder the miracle of God becoming flesh, think also of Mary. Think also of a 14 year old girl you know. Ponder what would happen to her if she were forced into pregnancy, and was unable to access a doctor, a midwife, or even a clean floor on which to give birth. Think also of the mother that died in the last 90 seconds in childbirth. Think of the women that are valued not as people, but for the service their uterus provides. They are forced into pregnancy too young, and too often. They are giving birth in terrible conditions. They are dying. Their children are suffering. They need us. The United Methodist Committee on Relief provides a guide for putting together Birthing kits. If you are interested in putting these together, you must follow the guidelines precisely. Follow this link, then click on “Birthing Kits” along the right side of the page. This is a great way to #BeChristInChristmas. Sometimes I feel like there are really two Christmases. There is the Christmas that drives our nation’s economy. It gives us “Black Friday,” where retail stores turn red bottom lines into black ones. It gives us a myriad of commercials, jobs, advertisements, tie-ins, door-busters, and TV specials. It focuses on, at best, the joy of giving and gathering with family. It focuses, at worst, on consumerism, materialism, and the illusion that stuff=happiness. This is the Christmas that the vast majority of Americans celebrate, and it is only superficially linked to the birth of a Nazarene boy that would defend the widows and children, stand up to religious hypocrisy, break down man-made barriers, challenge the status quo of the powerful, and become the Savior of the world. It is an important part of our culture, and it is not going anywhere. For many, the desire to “Keep Christ in Christmas” is a backlash against the first Christmas I described. They see that in many ways Christ has been removed from Christmas celebrations, and they mourn that. I understand, but I think getting upset over someone saying “Happy Holidays,” or not finding a baby Jesus in a public park is misguided. If you’re looking for Jesus in the secular, cultural Christmas, then you’re looking in the wrong place. In the past, I’ve written some pretty angry and pointed posts about this subject. I don’t feel like being angry anymore. Instead, I offer this suggestion. The only way to keep Christ in Christmas is to be Christ in Christmas. If you want to find Christ this Christmas, you can still find him. If you think someone can take Christ out of Christmas by removing a statue from a park, then I think you underestimate the power of Jesus Christ. No one can take Christ out of Christmas where the people of God are being the body of Christ. If you want to keep Christ in Christmas, then spend as much money on others in need as you do on your family for gifts. Work for justice. Love mercy. Walk humbly with your God. Love your neighbors. Love your enemies. Forgive. The United Methodist Committee on Relief offers a few suggestions, and resources to actually get it done. I’d love to find out more ways that you are going to #BeChristInChristmas. I would love to see this hashtag become active on twitter. Share ways that you are being the body of Christ. Are you volunteering at a homeless shelter? Donating to a clothes closet or food pantry? Are you sharing your gifts and blessings so that other may be blessed? Share it. Tweet it. Do more than wish someone Merry Christmas. Be someone’s merry Christmas. As Teresa Avila said, “Christ has no body but yours. No feet on earth, but yours.” So if you want to keep Christ in Christmas. #BeChristInChristmas. It would be awesome if at some point this Christmas season, #BeChristThisChristmas could trend on twitter. These two cover photos could help people start thinking about how they can do something more at Christmas than complain about store signs and school plays that don’t proselytize. Follow the Fat Pastor on Facebook and share with all of your friends. My perspective on waiting for Christmas was forever changed when my wife was expecting our first daughter. During my first Advent as a pastor, I was not only expecting the coming of the Christ child, but was eagerly anticipating the coming of my first daughter (who would be born in January). Anticipating the coming of a child is like no other kind of waiting I’ve ever experienced. We did our best to prepare. We put together a crib. We stocked up on diapers. We were given clothes and books and toys and countless well-wishes and prayers. We were overwhelmed by the generosity of our family and friends. As we waited for the child to come we knew that we were surrounded by an entire church family that was eagerly waiting with us. It was appropriate that the process of giving birth began in church. At the end of a Bible study, surrounded by a few of our closest friends, my wife knew that the baby was coming. About 18 hours later we were holding our daughter. I held that precious, fragile, resilient little baby in my arms and I knew one thing: I was not ready. There is no way to be totally ready for a baby to come. There are certainly different levels of preparedness, but no one can anticipate, guess or even imagine what it is like to suddenly be entrusted with a child. In that moment I knew that I would do anything – any thing – to protect that child and her mother. She changed my perspective. She changed my goals. She changed my dreams, my hopes, my fears and my worries. For the rest of my life my joy would be magnified by her smile, my despair would be multiplied by her tears, and my peace would depend on her safety. A baby changes everything – and that is the message of Christmas. The birth of Jesus changed everything. The eternal Word of God was made flesh, and nothing would ever be the same. 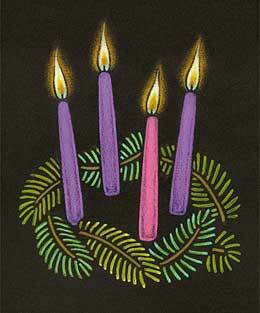 At Advent we are called to prepare the way of the Lord. There are many things that we can do to prepare the way of the Lord. I’ve been tweeting #BeChristInChristmas with ideas and ways to work for the Kingdom of God during the Christmas season. We can read the Bible, pray, study, worship, serve, and wait. There are so many ways that we can prepare for the coming of the Christ child, but the fact remains is that we can never be fully ready. The birth of Jesus changed everything, and as we move through Advent my prayer is that Christmas can break through the hearts and minds of all who would separate themselves from God. Allow God to change your perspective. Allow God to change your goals. Open up and let Jesus change your dreams, your hopes, your fears and your worries. Allow your Joy to be magnified by the glory of God. Invite the Holy Spirit to weep with you in your times of despair. May the peace of Christ – the peace that surpasses all understanding – be with you. This Christmas, Jesus can change everything. I tell people, “Happy Holidays.” Does that make me any less of a Christian? I don’t think it does, but apparently some people do. As we approach the holiday season, I am bracing myself for the onslaught of “Keep Christ in Christmas” slogans on facebook. I decided to make a preemptive strike, and created this picture. 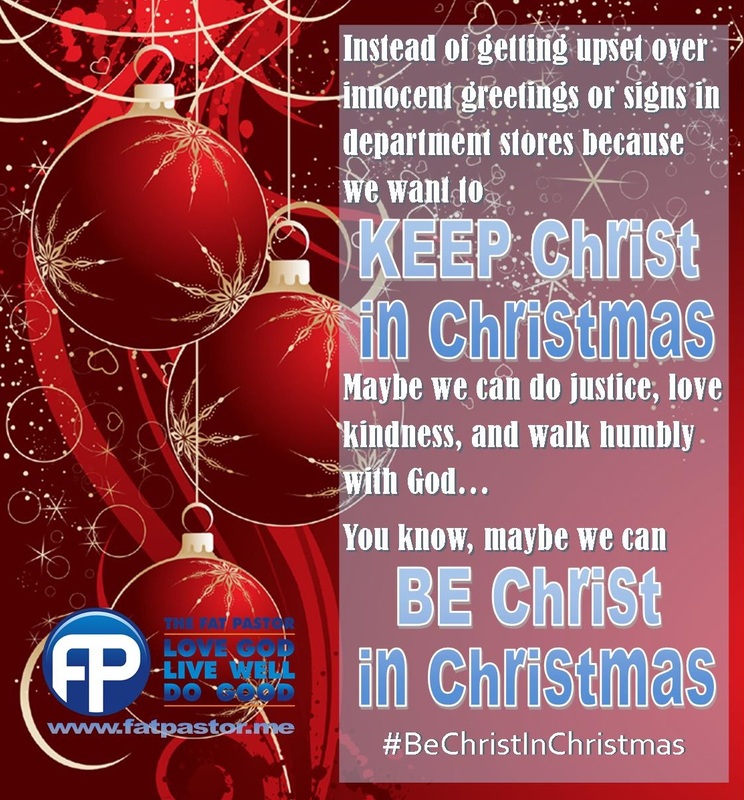 Believe me, I want to keep Christ in Christmas, but I’m not looking for Christ at JC Penny or Kohls. If I want to find Christ in Christmas I will look to a local food pantry or a wardrobe ministry. I will look to a homeless shelter or domestic abuse shelter. If I want to find Christ in Christmas I will go to worship with my brothers and sisters in Christ. I will sing the songs of the ages, and proclaim the good news of Jesus Christ to the world. I will invite my neighbor to worship with me, or I will read the Bible and pray. Nothing can keep Christ out of Christmas if I endeavor to be the body of Christ this Christmas. So please, spare me the “war on Christmas” rhetoric. Do you want to know who is waging a war on Christmas? Do you want to know who is spoiling the birth of Christ? It is not the people that have the gall to greet you with “Happy Holidays.” The ones waging a war on Christmas are those that think greed and discrimination are Christian values. They are the ones that think that performance fleece, ipads, diamond earrings, and flatscreens have anything to do with the birth of Jesus Christ. And before I get too carried away with this rant, let me pause for confession. I know that I can get caught up in the consumerism of it all. I enjoy buying presents for my family and my daughter. I enjoy receiving presents, and am already thinking about “What I want for Christmas.” I know that I will enjoy a holiday in a warm home with plenty of food, and a few gadgets that I certainly don’t need. But I’m going to try. I’m going to try and live simpler. I’m going to try and seek the true gift of Christmas – the peace of Jesus Christ. I am going to pray more. I am going to read more. I’m going to give a little more. I’m going to sin, but I’m also going to forgive. My economic gain or lower prices will come at the cost of another, but I’m also going to do justice. I’m going to be selfish but I’m also going to show mercy. I’m going to be very happy if this little picture catches on and goes viral, but I’m also going to try and walk humbly with my God. I’m going to do all of those things because that, I think, is the true meaning of Christmas. On twitter use #BeChristInChristmas to share how you are working for the Kingdom of God this Christmas season. 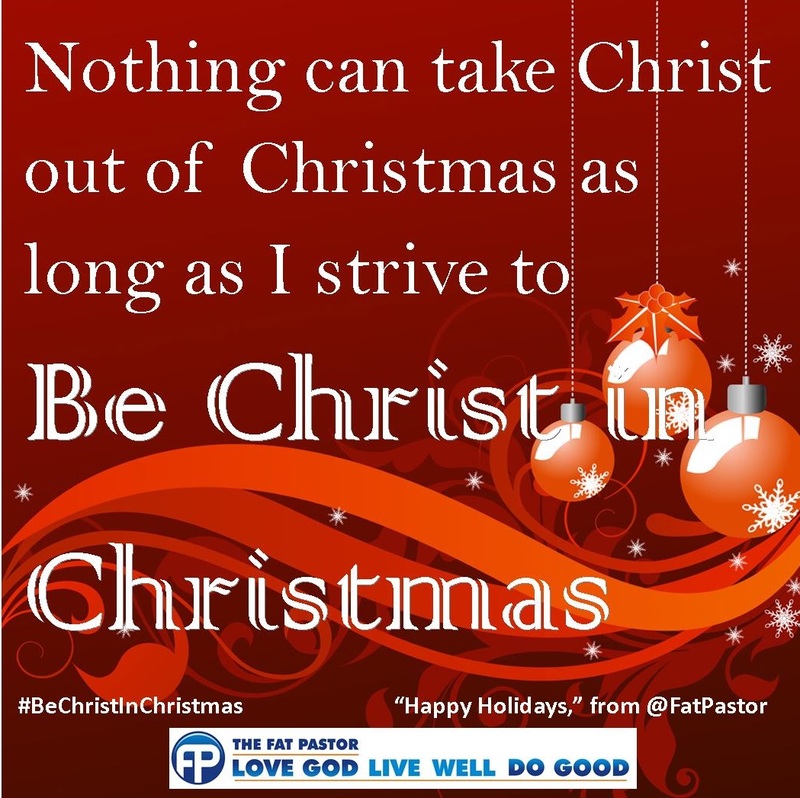 Be Christ This Christmas – Another poster for Facebook. Here’s a poem that I wrote for Advent. Keeping Christ in Christmas is about more than how you greet someone or what the sign at JC Penny’s reads, or what you call the decorated tree on the lawn at City Hall. If you want to keep Christ in Christmas, do something that Christ would actually care about. Feed the hungry, cure the sick, share the good news of Jesus Christ, invite someone to church, pray for others, read your Bible. Those are the things that we can do to keep Christ in Christmas. Here’s one way Chenoa UMC is trying to keep Christ in Christmas: by giving food to kids over Christmas break. We are trying something new at our church. It was an idea that started in a small group Bible study. Inspired by the call to Risk-Taking Mission, the group decided to try and make Christmas Lunch Boxes for elementary school students that would not have lunch over Christmas Break. So they started collecting food, and telling others. In a matter of a few days a few hundred dollars and a table full of food has been donated. The principal of Chenoa Elementary was contacted, and a letter is going to go out to every student inviting parents to either make a donation or to call the church to get a Christmas Lunch Box. We don’t know what is going to happen next, but we feel the power of the Holy Spirit in this mission. We know that there is going to be a child that wakes up on Christmas morning, and might not know a thing about Jesus or the Bible, but they will also not know hunger. That child will sit down at a table and eat a sandwich and Christ will be there – right smack dab in the middle of Christmas. A few weeks ago I read a letter to the editor which basically said that anyone who says, “Happy Holidays,” is a P.C., Christmas-hating, God-ridiculing, Communist. Okay, so those weren’t his exact words, but he was clear that he was not a fan of the alliterative greeting. I really do not understand why people do not like the greeting “Happy Holidays.” I too celebrate Christmas, but if I want to say, “Happy Holidays,” does that make me less Christian? Is saying “Merry Christmas,” really the badge of true Christianity? When someone says “Merry Christmas,” are they then keeping the day holy? The only reason most people care about whether or not you say “HH” or “MC” is because Bill O’Reilly made it a big deal. Before he claimed that there is a “war on Christmas,” no one noticed said war. “Seasons Greetings,” and “Happy Holidays” have been accepted greetings for years. There is an old Christmas song, “Happy Holidays,” that no one seemed to mind. The word holiday is a contraction of the words holy day, so in effect, we are saying “Happy Holy Days,” thus keeping Christmas holy. Plus, this is simply the time of year when there are a lot of holy days. Beginning with Thanksgiving, then Christmas, and New Years, this is considered the holiday season. I’m not sure why acknowledging a coincidence of our calendar is somehow seen as “attacking Christmas.” Another holy day in this season is Hannukah. Hannukah is actually a minor feast day in the Jewish tradition, but has been co-opted for commercial reasons. Much like Christmas was. For many centuries Christmas was not a holiday. Two of the four Biblical Gospels give no account of Jesus’ birth, and Matthew and Luke have almost no references back to the birth stories once they are over. The birth stories were not a big deal to early Christians. Christmas only became a holiday as a way to appease pagans in the Roman empire. It is little more than a co-opted winter festival. But today it has become an important holiday. Not only in our religion, but more so in our culture and economy. Many retailers depend on the holiday season to survive. And mind you, not everyone buying a bunch of crap at Christmas time is Christian. For the most part, Christmas has become a cultural holiday – driven by economic need much more than religious fervor. So when people get angry when someone says “Happy Holidays,” I get angry that they are angry. If you want to keep Christ in Christmas, worry about things more important than the signs and decorations at JC Penney. You think Christmas should be about Christ? Then take up your cross and follow Jesus – not into department stores, but into the prisons, the hospitals, among the poor and the outcast. You get angry when someone doesn’t say “Christmas?” Try getting angry over Christ’s children dying of malnutrition or AIDS. Try getting angry over the fact that the Christmas chocolate you love so much was kept cheap on the back of the working poor. Try getting angry over the fact that Christians are keeping people out of churches with their closed minds and closed doors. You brood of vipers. You hypocrites. Try getting upset over something that matters. Merry Christmas and Happy Holidays.